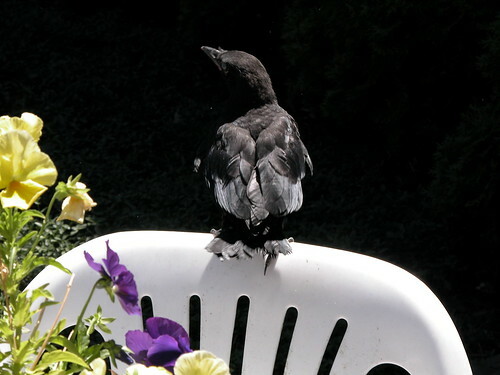 Jacob The Keeper: Like a scene from Hitchcock's "The Birds"
Since July 4th we've had a young crow walking about our yard, unable to fly. Not only does he make alot of noise, but his crow "family" has been making a terrible invasion. The circle, they land in trees, and worst of all is their incessant noise! They also "attacked" Jake. We explained to Jake to leave the crow alone, but I think he'd already gotten the message from the crows themselves. Sunday the small one that had taken our yard for his own managed to get into a chair and from there to the patio table. Then he made it to the back of a chair. He still cries until one of the big birds brings food, then he puts his head on the table and goes to sleep for at least a brief period. Hopefully he will soon be big enough to fly away! 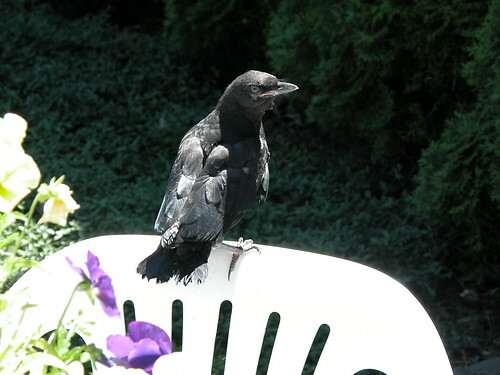 Crow does not care for the camera and keeps an eye on John when John went out to take a few photos. No shot yet of bird sleeping on the table with his head right down on table. Wonder if he expects to be provided with a pillow?